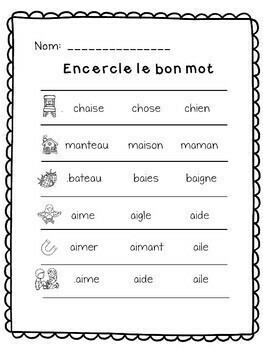 French Phonics Activities, Bingo, sons composes, feuilles de travail! 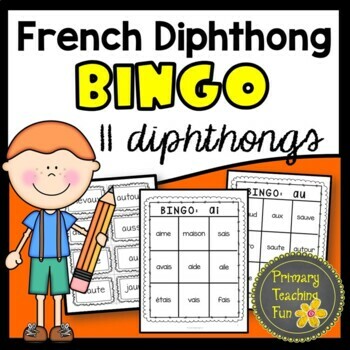 Learning dipthongs can be fun when you are playing BINGO! 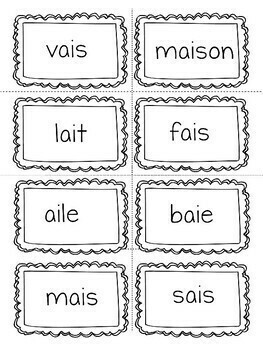 In this product, students will practise 10 phonics sounds (in and im are together), each sound has 10 BINGO cards, calling cards, 1 visual dictionary, and 1 worksheet. 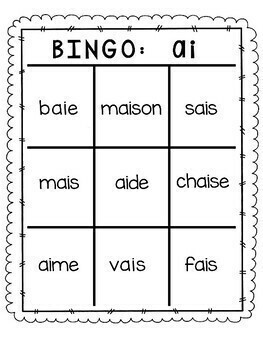 The BINGO cards have only 9 words so the game will be short and there is a lot of repetition. Ideal for working with a small group as a literacy centre. Suggested grades: 1 and 2. 126 usable pages! I would really appreciate it if you rated my work. This is easy to do and you can earn TPT credits towards purchasing another product. Go to 'My Purchases' and click on 'Give Feedback.' Click the rating you want and leave a brief comment. Thank you and enjoy!